In the GCSE Chemistry exam, questions based on practicals will often ask you to describe what you would expect to see. In this short blog we explain how to describe reactions in the necessary detail and how to record measurements from diagrams of practical experiments. Let’s consider a displacement reaction between copper sulfate and magnesium, illustrated below. In the exam, you may be asked to describe what you observe in this reaction. Be careful not to give a really vague answer, like “it went colourless.” That’s not specific enough. What went colourless? What colour was it before? Did anything else happen? A better answer would be something like “the solution changed from blue to colourless, the magnesium strip disappeared/dissolved and a red/orange solid was formed.” This answer more precisely describes what both the solution and the solid looked like before and after the reaction took place – and will give you the full marks available. Another common question in the exam is to describe the reaction between a Group 1 metal and water. Exam questions often ask what would be observed in this reaction. Answers normally accept two of the key observations: bubbles of (hydrogen) gas are produced/effervescence/fizzing; the metal floats on the water’s surface and moves around; the metal dissolves/disappears; if universal indicator was added to the water, it would change from green (neutral) to blue or purple (alkali). It really helps to remember these sorts of details about reactions. Because knowing them will help with follow-up questions such as writing a chemical equation for the reaction or adding state symbols to the equation. In the exam, you may be required to take a measurement from a diagram of a practical experiment. 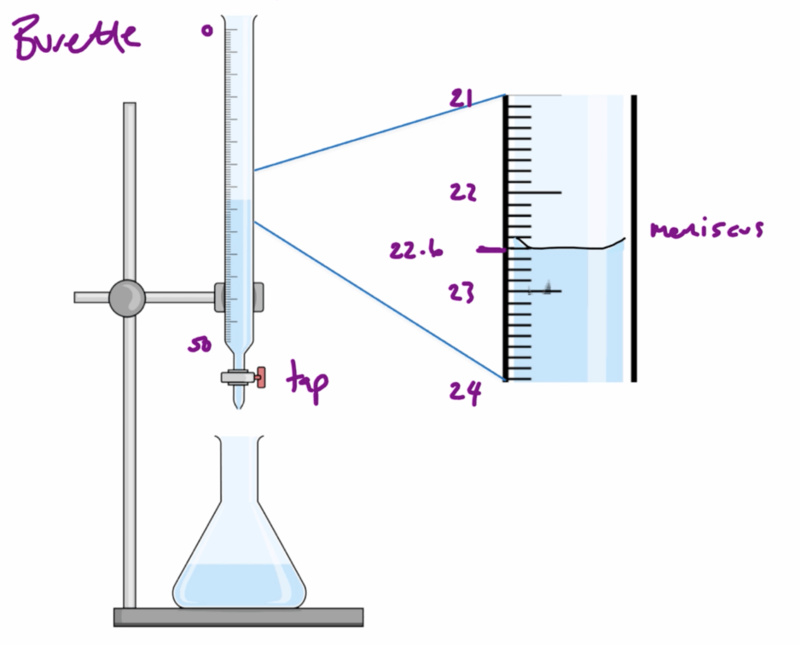 For example, you might be asked to measure the amount of acid left in the burette at the end of a titration. 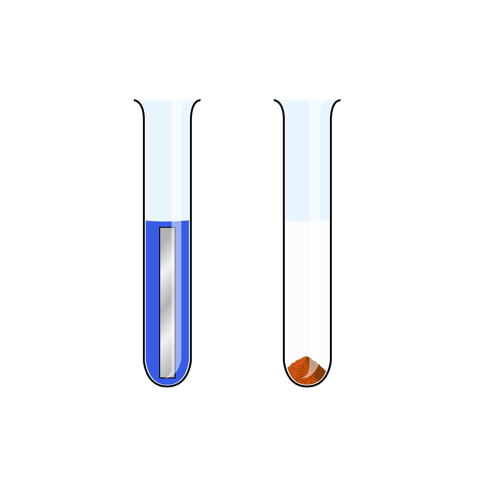 The measurement at the top of the burette (when it is full) is 0, while at the bottom (when it’s empty) it’s normally 50cm3. This is because burettes measure how much liquid has been let out of the tube. The measurement must be taken from the bottom of the meniscus (as shown in the diagram). That’s it for now! In the exam, when you’re faced with questions based on practicals, remember to describe reactions in the necessary detail and remember to be careful when you’re recording measurements!